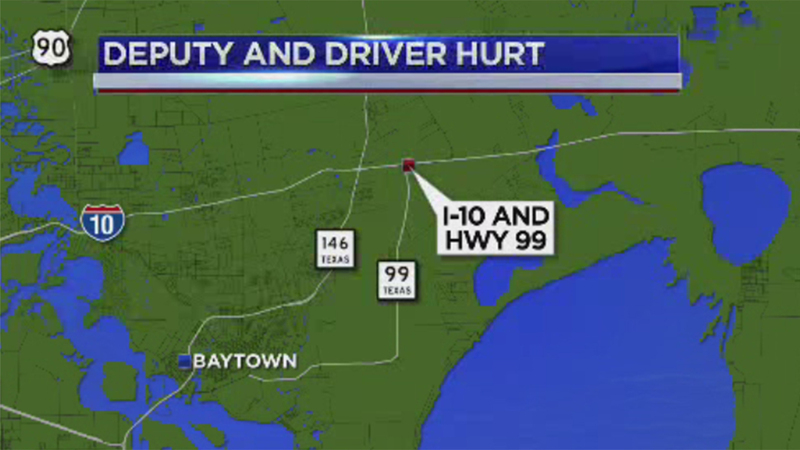 MONT BELVIEU, TX (KTRK) -- A Chambers County deputy was assisting a driver this morning when both of them were struck and airlifted to the hospital. It happened at around 11:15am along I-10 just east of the Grad Parkway. The deputy and driver were on the eastbound shoulder when a driver struck them, sending both of them into a ditch. Both the deputy and driver were taken by Life Flight to Memorial Hermann Hospital. We're told the deputy has severe injuries to his leg and the driver he was helping suffered severe hip and leg injuries. Both are in stable condition. The driver was transported to Houston Methodist San Jacinto Hospital in Baytown. The DPS is handling the investigation. At this point, it's not clear what, if any, charges will be filed on the driver.